A simplified yet accurate method to collect and stain mosquito hemocytes is described. Our method combines the simplicity of perfusion with the accuracy of high injection techniques to isolate clean preparations of hemocytes in Aedes mosquitoes. This method facilitates studies requiring knowledge of the types of hemocytes and their abundance. Qayum, A. A., Telang, A. A Protocol for Collecting and Staining Hemocytes from the Yellow Fever Mosquito Aedes aegypti. J. Vis. Exp. (51), e2772, doi:10.3791/2772 (2011). Mosquitoes are vectors for a number of disease-causing pathogens such as the yellow fever virus, malaria parasites and filarial worms. Laboratories are investigating anti-pathogen components of the innate immune system in disease vector species in the hopes of generating transgenic mosquitoes that are refractory to such pathogens1, 2. The innate immune system of mosquitoes consists of several lines of defense 3. Pathogens that manage to escape the barrier imposed by the epithelium-lined mosquito midgut 4 enter the hemolymph and encounter circulating hemocytes, important cellular components that encapsulate and engulf pathogens 5, 6. Researchers have not found evidence for hematopoietic tissues in mosquitoes and current evidence suggests that the number of hemocytes is fixed at adult emergence and numbers may actually decline as the mosquito ages 7. The ability to properly collect and identify hemocytes from medically important insects is an essential step for studies in cellular immunity. However, the small size of mosquitoes and the limited volume of hemolymph pose a challenge to collecting immune cells. Two established methods for collecting mosquito hemocytes include expulsion of hemolymph from a cut proboscis 8, and volume displacement (perfusion), in which saline is injected into the membranous necklike region between the head and thorax (i.e., cervix) and the perfused hemolymph is collected from a torn opening in a distal region of the abdomen 9, 10. These techniques, however, are limited by low recovery of hemocytes and possible contamination by fat body cells, respectively 11. More recently a method referred to as high injection/recovery improved recovery of immunocytes by use of anticoagulant buffers while reducing levels of contaminating scales and internal tissues 11. While that method allows for an improved method of collecting and maintaining hemocytes for primary culture, it entails a number of injection and collecting steps that are not necessary if the downstream goal is to collect, fix and stain hemocytes for diagnostics. Here, we demonstrate our method of collecting mosquito hemolymph that combines the simplicity of perfusion, using anticoagulant buffers in place of saline solution, with the accuracy of high injection techniques to isolate clean preparations of hemocytes in Aedes mosquitoes. Prepare a hemolymph diluent solution that consists of 60% Schneider's Medium, 10% fetal bovine serum (FBS), and 30% citrate buffer (anticoagulant; 98 mM NaOH, 186 mM NaCl, 1.7 mM EDTA, 41 mM citric acid, pH 4.5) 11. Make 1.0 mL aliquots that can be stored at -20°C. Use each aliquot only once (see Materials). Prepare glass microscope slides (75 x 25 x 1 mm) by scoring a 1 cm diameter circle at one end using a glass-etching tool. Alternatively, microscope slides with two pre-etched circles can be purchased (e.g. Fisher Scientific or EMS sources). One glass slide per mosquito will be needed. Using the suggested settings on this puller, we construct needles that are around 500 mm in overall length with shank lengths of around 3 mm. Pre-pulled needles can also be purchased (e.g. Tritech Research). Insert a pulled needle into the microinjector needle holder according to manufacturer's instructions. Backfill the microinjector (see Materials) tubing, syringe and pulled glass needle with mineral oil according to manufacturer's instructions. Aspirate 15 adult females into small solid cage containers that can be in contact with ice. Immerse cage with mosquitoes in ice deep enough so that entire height of cage and all sides are in contact with ice. This will ensure that all the mosquitoes will be exposed to the cold. Cold anesthetize mosquitoes for about 8 minutes or until they are no longer mobile. Place one mosquito onto a depression slide. This slide will serve as the site for injections. Set the microinjector to take up 12 μl of hemolymph diluent into pulled glass needle and inject solution into the mosquito between the seventh and eighth abdominal segments. About 3 mosquitoes can be injected with 3-3.5 μl of the total 12 μl volume taken up. The mosquito should be gently held in place with forceps while injection is performed. A small volume of diluent should remain at the tip of the needle so as to prevent mineral oil from being injected. After injection the abdomen should look "filled" or bloated. Place injected mosquitoes in a separate clean container on ice to recover for 5 min. The incubation of the anticoagulant diluent solution inside the mosquito will help dislodge hemocytes adhering to internal tissue. On average 3 to 5 fresh mosquitoes can be injected during each 5 min recovery period. After 5 minutes of recovery, snip off legs, wings, and the tip of the abdomen (at the eighth segment) of each mosquito one at a time using micro scissors. This should be done in the recovery cup placed on ice. Cutting off the legs and wings reduces the likelihood of scales being transferred to collection slides. Note: do not cut legs and wings too close to thoracic attachment sites or you risk creating other openings for hemolymph to escape. Hemolymph should only be collected through the opening created at the tip of the abdomen. Wash one glass etched microscope slide with 70% Ethanol and dry it with a kimwipe. Position one injected and recovered mosquito on the slide on the outer edge of the etched circle. Set microinjector to pick up 12 μl of fresh hemolymph diluent and inject this volume into the mosquito in the lateral side of its mesothorax. Deliver most but not the entire volume of diluent (about 8 – 10 μl) so as to prevent mineral oil from being injected. A small volume of diluent should remain at the tip of the needle. Position the mosquito so that the cut abdominal opening is at the edge of the 1 cm circle. After injection the diluted hemolymph should be collected within the marked area. Once the needle is removed from the mesothoracic injection site, resume holding the mosquito between the two arms of the forceps and gently squeeze the abdomen with those forceps to direct the hemolymph onto the etched circle area. Allow diluted hemolymph to dry on slide for about 10 minutes or until it is visibly dry. Stain each slide separately with HEMA3 7 (see Materials): Dip slide in fixative 5 times for 1 second each time; Dipslide in solution I 3 times for 1 second each; and, finally, dip slide in solution II 3 times for 1 second each. Rinse the back of slide with DI water. The front of the slide should not be rinsed. Blot-dry the front of the slide outside etched circle containing stained tissue. Apply mounting medium (e.g. Shur/Mount or Polymount) around the etched center and place a cover slip on it. Press down lightly onto the cover slip (25 x 25 mm) so that the mounting medium spreads to the entire area covered by the cover slip (including etched circle containing stained tissue). Allow slides to dry for a minimum of 3 hours or overnight. Hemocytes should be viewed within 2 weeks following collection for optimum visualization and imaging. Examples of fixed and HEMA3 stained hemocytes collected from an Aedes aegypti adult female are shown in Figure 1A-C. Figure 1A shows a hemocyte that we identified as a prohemocyte based on its small size, spherical-spheroidal shape and high nuclear to cytoplasm ratio (550x magnification) 11. Figure 1B shows a hemocyte classified as an oenocytoid based on its spheroidal shape and high cytoplasm to nuclear ratio (550x magnification). Lastly, Figure 1C shows a granulocyte-type hemocyte (550x magnification). Granulocytes are more granular in nature and tend to be more amoeboid in shape and behavior as they adhere to glass surfaces. 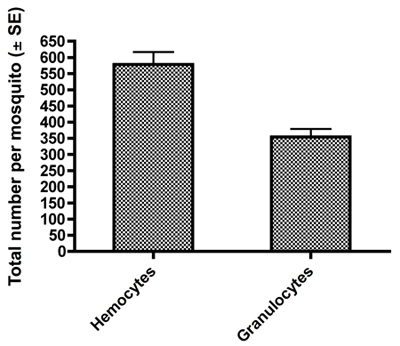 Using previously published criteria for hemocyte typing and recovery 11, our collection method yielded a similar number of total hemocytes and we likewise found that granulocytes make up the largest percentage of total hemocytes 11 (Fig 2). Figure 1. Light microscope images of a representative HEMA3 fixed, stained prohemocyte (A), oenocytoid (B), and granulocyte (C) from an Ae. aegypti adult female. C = cytoplasm, N = nucleus G = granules. Figure 2. Total counts ± SE of all hemocytes and granulocytes obtained per female mosquito by our hemolymph dilution and collection method. The hemocyte collection method described here is modified from previously published methods and allows one to isolate clean preparations of hemocytes from Aedes mosquitoes with fewer steps. While our particular interest lies in characterizing hemocyte populations in Aedes mosquitoes, we believe this technique can be applied to other mosquito groups after initial trials are conducted to determine proper injection volumes. Our protocol uses anticoagulant buffers in place of saline solution and yields a population of hemocytes that accurately reflects the numbers in vivo. However, we have not yet determined suitability of our protocol for maintaining isolated hemocytes in culture. Collection of hemolymph via a cut proboscis has been shown to yield the fewest number of circulating hemocytes and will not be further discussed here. Perfusion-based methods, while easy to conduct, have been criticized for allowing a greater level of contamination from internal tissues and scales 11. Recently, high injection/recovery methods were developed to improve recovery of hemocytes, while reducing levels of contaminates 11, but entails a number of injection and collecting steps. Our protocol obtained the same level of recovered hemocytes and reduced contaminants but with fewer injection and collecting steps, thereby offering a simple yet accurate method to obtain clean preparations of hemocytes. First, the simple step in our protocol of removing legs, wings and the tip of the abdomen in a container separate from where hemolymph is collected results in much cleaner preparations of hemocytes. Second, our method gains accuracy by utilizing glass needles held in a needle holder attached to a positive-displacement microinjector. While diluent can likewise be injected using hand-held needles or other hand-held delivery devices, use of a microinjector increases the accuracy of delivery volume and subsequently results in consistent volume of collected hemolymph. Our trials indicate that combined injection volumes of 9.5 to 10.5 μl (steps 4.1 and 4.4) allowed us to consistently collect 9-10 μl of hemolymph from injected female mosquitoes (unpublished data), thereby providing another measure of consistency in quantifying hemocyte populations. Our method simplifies overall collection by removing the need for other hand-held injection needles and/or glass capillary tubes to collect diluted hemolymph. Authors would like to thank John Frey and Ben Peterson for mosquito rearing. We also thank Christine Davis and Gary Radice for help with hemocyte micrographs. This research was funded by University of Richmond Arts & Science summer fellowship to A. A. Qayum and faculty grant to A. Telang. Glass needles (borosilicate with filament) Sutter Instrument Co. BF100-78-10 1.0mm O.D. and 0.78mm I.D. Enayati, A., Hemingway, J. Malaria management: past, present, and future. Annu. Rev. Entomol. 55, 569-569 (2010). Medlock, J., Luz, P. M., Struchiner, C. J., Galvani, A. P. The impact of transgenic mosquitoes on dengue virulence to humans and mosquitoes. The American Naturalist. 174, 565-565 (2009). Baton, L. A., Garver, L., Xi, Z., Dimopoulos, G. Functional genomics studies on the innate immunity of disease vectors. Insect Sci. 15, 15-15 (2008). Thomas, R. E., Wu, W. K., Verleye, D., Rai, K. S. Midgut basal lamina thickness and dengue-1 virus dissemination rates in laboratory strains of Aedes albopictus (Diptera: Culicidae). J. Med. Entomol. 30, 326-326 (1993). Bartholomay, L. C. Profiling infection responses in the haemocytes of the mosquito, Aedes aegypti. Insect Mol. Biol. 16, 761-761 (2007). Strand, M. R. The insect cellular immune response. Insect Sci. 15, 1-1 (2008). Hillyer, J. F. Age-associated mortality in immune challenged mosquitoes (Aedes aegypti) correlates with a decrease in haemocyte numbers. Cell. Microbiol. 7, 39-39 (2005). Chen, C. C., Laurence, B. R. In vitro study on humoral encapsulation of microfilariae: establishment of technique and description of reaction. International Journal for Parasitology. 17, 781-781 (1987). Beerntsen, B. T., Christensen, B. M. Dirofilaria immitis: effects on hemolymph polypeptide synthesis in Aedes aegypti during melanotic encapsulation reactions against Microfilariae. Exp. Parasitol. 71, 406-406 (1990). Hillyer, J. F., Schmidt, S. L., Christensen, B. M. The antibacterial innate immune response by the mosquito Aedes aegypti is mediated by hemocytes and independent of Gram type and pathogenicity. Microb. Infect. 6, 448-448 (2004). 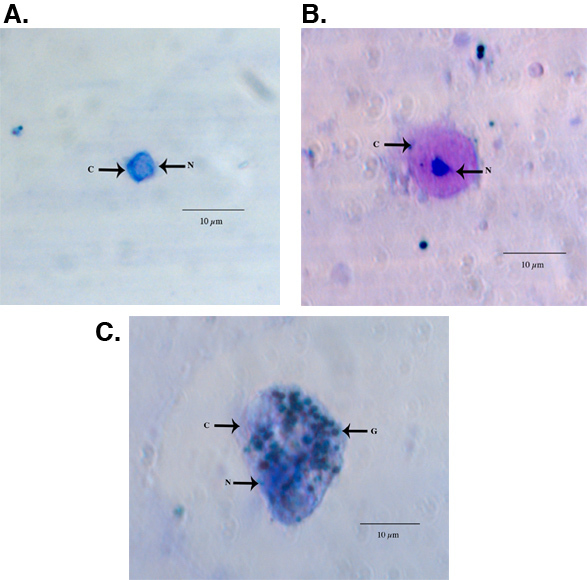 Castillo, J. C., Robertson, A. E., Strand, M. R. Characterization of hemocytes from the mosquitoes Anopheles gambiae and Aedes aegypti. Insect Biochem. Mol. Biol. 36, 891-891 (2006).